Why would an investment banker who has raised $1 billion dollars through stock exchange listings, capital raisings, private placements and debt mandates, abandon his rosewood desk to run an exploration company in the remote mountains of Southern Ecuador? Answer: for 6.4 million ounces of gold indicated resource and 2.1 million ounces gold inferred resource (both NI 43-101 resources). Glenn Laing, the President, CEO and Director of Ecuador Gold and Copper (EGX-TSX.V) has 35 years’ experience in the mining and financial industries. EGX is focusing on five main deposits within the Condor Complex which include: 1) Santa Barbara 2) Los Cuyes 3) Soledad 4) El Hito 5) Chinapintza (Joint Venture). 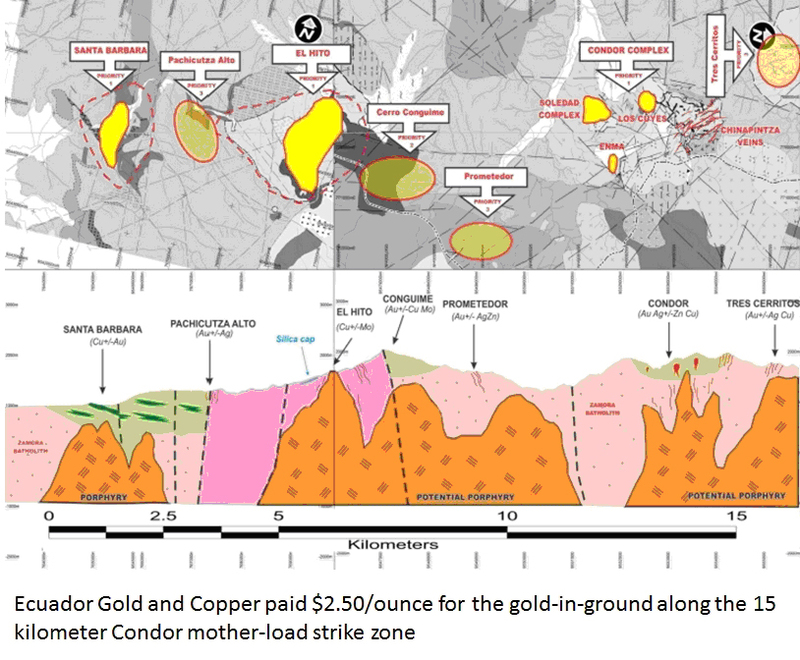 The Condor gold project has an NI 43-101 indicated resource of 6.4 million oz gold (averaging 0.62 g/t) and inferred resource of 2.1 million oz gold (averaging 0.52 g/t). Also a 43-101 indicated resource of 18.5 million oz silver (averaging 2.43 g/t) and inferred resource of 4.5 million oz silver (averaging 1.09 g/t) and a 43-101 inferred resource of 1.1 billion lbs copper (0.31%). “Our flagship asset is Santa Barbara,” states Laing, “There is a reason I brought in a Chinese player to Chinapintza. China and Ecuador already have a strong financial partnership. The development of the Santa Barbara deposit will very likely involve Chinese partners. We are ensuring that they are having a good experience, in terms of the permitting and the mining protocols in Ecuador”. Highlights from the recent 10,000 metre drill program include: Hole DSB-23 (Santa Barbara) intersected almost continuous gold and copper mineralization over 496 meters from 204m to 700m grading an average of 0.90 g/t gold and 0.12% Cu. Hole DCU-41 (Los Cuyes) encountered 149.0 m @0.84g/t Au and 9.0 g/t Ag and Hole DEH-05 (El Hito) intersected relatively continuous copper mineralization over 703 meters from 8.0m to 711.0m grading an average of 0.31% Cu and 1.18 g/t Ag. Ecuador has a rapidly improving mining regime. There is a well understood favorable mining geology in the Andean Mineral belt. Mining contracts have recently been negotiated with Chinese-backed EcuaCorriente. INV Metals recently acquired IAMGOLD’s Quimsacocha Project. EcuaCorriente is proceeding with construction of Mirador copper and gold mine. All business in Ecuador is transacted in US dollars. 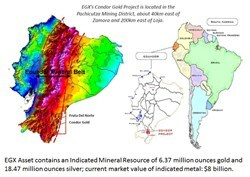 The Condor project is located approximately 40 km east of the town of Zamora in the Pachiicutza Mining District. Four types of mineral systems exist: 1.) Low sulphidation epithermal gold 2.) Structurally controlled vocaniclastics & breccia pipes 3.) Polymetallic (Au, Ag, Pb, Zn) mesothermal veins and 4.) Structurally controlled high grade epithermal gold. In an interview last week, Kevin MacLean, Senior Vice-President of Sentry Precious Metals Fund stated that the last time his fund declined this dramatically, it subsequently went up 600%. The macro fundamentals for gold are intact: the vast increase in the monetary base will devalue currencies and inflate the value of hard assets. EGX anticipates completing a Preliminary Economic Assessment by Q1 2014. It is currently trading at $.11 with a market cap of $22 million. A fee has been paid for the production and distribution of this Report. This document is not and should not be construed as an offer to sell or the solicitation of an offer to purchase or subscribe for any investment. No information in this article should be construed as individualized investment advice. A licensed financial advisor should be consulted prior to making any investment decision. Financial Press makes no guarantee, representation or warranty and accepts no responsibility or liability as to its accuracy or completeness. Expressions of opinion are those of the author’s only and are subject to change without notice. Financial Press assumes no warranty, liability or guarantee for the current relevance, correctness or completeness of any information provided within this article and will not be held liable for the consequence of reliance upon any opinion or statement contained herein or any omission. Furthermore, we assume no liability for any direct or indirect loss or damage or, in particular, for lost profit, which you may incur as a result of the use and existence of the information, provided within this article. Ecuador Gold and Copper Corp.